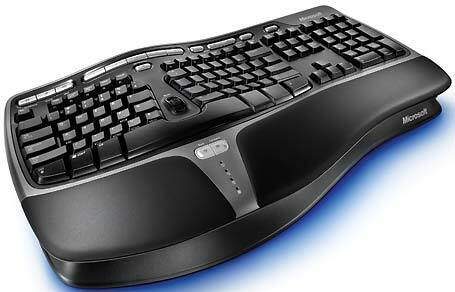 The feature-rich Natural Ergonomic Keyboard 4000 emphasizes comfort. Poor typing posture can wreak havoc on your wrists, but few people take the time to correct such hazardous habits. Enter Microsoft's Natural Ergonomic Keyboard 4000. Although it took me a while to get used to the keyboard's unconventional design, the results were worth the effort. The 4000 attempts to correct your hand positioning in several ways. First, its keys are laid out in a curve similar to the shape of a seagull's wings, with center keys that are proportionately oversize to compensate for how often you use them. Its gable design lets you position your forefingers higher than your little fingers, so your wrists adopt a more natural position. The keys on each side sit in a concave configuration, which helps you reduce repetitive motions. As a touch typist, I initially found positioning my hands comfortably on this shipping unit difficult. But after about a day, I got accustomed to the way it felt. The well-padded palm rest made everything feel even more comfy. There are keys for launching applications, a convenient zoom button, and an array of customizable buttons. While these extras enhance productivity, the unique ergonomic features are what distinguish this keyboard. Unfortunately, the 4000 is USB-only--and you can't use a PS/2 adapter. Plus, at $65 it seems just a tad pricey for a wired keyboard. But I'm willing to pay a little extra for the sake of comfort. The comfort and relief provided by this ergonomic keyboard justify the fairly high price.